Signed photo of John Hollins the Chelsea footballer. 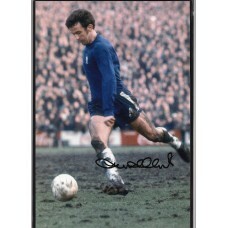 Home » Signed pictures » Signed photo of John Hollins the Chelsea footballer. John Hollins. This is a fabulous A4 size, 20 x 30 full length action photo of John Hollins the Chelsea footballer. This photo shows John Hollins in full length action. This item has a terrific hand signed autograph of John Hollins signed in black ink. John Hollins played 436 league games for Chelsea between 1963 and 1975 scoring 47 goals. John Hollins as also played once for the full England team in 1967.